For other kinds of motors, see Motor (disambiguation). For a railroad engine, see Electric locomotive. Animation showing operation of a brushed DC electric motor. An electric motor is an electrical machine that converts electrical energy into mechanical energy. Most electric motors operate through the interaction between the motor's magnetic field and electric current in a wire winding to generate force in the form of rotation of a shaft. Electric motors can be powered by direct current (DC) sources, such as from batteries, motor vehicles or rectifiers, or by alternating current (AC) sources, such as a power grid, inverters or electrical generators. An electric generator is mechanically identical to an electric motor, but operates in the reverse direction, converting mechanical energy into electrical energy. Electric motors may be classified by considerations such as power source type, internal construction, application and type of motion output. In addition to AC versus DC types, motors may be brushed or brushless, may be of various phase (see single-phase, two-phase, or three-phase), and may be either air-cooled or liquid-cooled. General-purpose motors with standard dimensions and characteristics provide convenient mechanical power for industrial use. The largest electric motors are used for ship propulsion, pipeline compression and pumped-storage applications with ratings reaching 100 megawatts. Electric motors are found in industrial fans, blowers and pumps, machine tools, household appliances, power tools and disk drives. Small motors may be found in electric watches. In certain applications, such as in regenerative braking with traction motors, electric motors can be used in reverse as generators to recover energy that might otherwise be lost as heat and friction. Electric motors produce linear or rotary force (torque) and can be distinguished from devices such as magnetic solenoids and loudspeakers that convert electricity into motion but do not generate usable mechanical force, which are respectively referred to as actuators and transducers. Cutaway view through stator of induction motor. The first electric motors were simple electrostatic devices described in experiments by Scottish monk Andrew Gordon and American experimenter Benjamin Franklin in the 1740s. The theoretical principle behind them, Coulomb's law, was discovered but not published, by Henry Cavendish in 1771. This law was discovered independently by Charles-Augustin de Coulomb in 1785, who published it so that it is now known with his name. The invention of the electrochemical battery by Alessandro Volta in 1799 made possible the production of persistent electric currents. After the discovery of the interaction between such a current and a magnetic field, namely the electromagnetic interaction by Hans Christian Ørsted in 1820 much progress was soon made. It only took a few weeks for André-Marie Ampère to develop the first formulation of the electromagnetic interaction and present the Ampère's force law, that described the production of mechanical force by the interaction of an electric current and a magnetic field. The first demonstration of the effect with a rotary motion was given by Michael Faraday in 1821. A free-hanging wire was dipped into a pool of mercury, on which a permanent magnet (PM) was placed. When a current was passed through the wire, the wire rotated around the magnet, showing that the current gave rise to a close circular magnetic field around the wire. This motor is often demonstrated in physics experiments, substituting brine for (toxic) mercury. Barlow's wheel was an early refinement to this Faraday demonstration, although these and similar homopolar motors remained unsuited to practical application until late in the century. Jedlik's "electromagnetic self-rotor", 1827 (Museum of Applied Arts, Budapest). The historic motor still works perfectly today. In 1827, Hungarian physicist Ányos Jedlik started experimenting with electromagnetic coils. After Jedlik solved the technical problems of continuous rotation with the invention of the commutator, he called his early devices "electromagnetic self-rotors". Although they were used only for teaching, in 1828 Jedlik demonstrated the first device to contain the three main components of practical DC motors: the stator, rotor and commutator. The device employed no permanent magnets, as the magnetic fields of both the stationary and revolving components were produced solely by the currents flowing through their windings. After many other more or less successful attempts with relatively weak rotating and reciprocating apparatus Prussian Moritz von Jacobi created the first real rotating electric motor in May 1834. It developed remarkable mechanical output power. His motor set a world record, which Jacobi improved four years later in September 1838. His second motor was powerful enough to drive a boat with 14 people across a wide river. It was also in 1839/40 that other developers managed to build motors with similar and then higher performance. The first commutator DC electric motor capable of turning machinery was invented by British scientist William Sturgeon in 1832. Following Sturgeon's work, a commutator-type direct-current electric motor was built by American inventor Thomas Davenport, which he patented in 1837. The motors ran at up to 600 revolutions per minute, and powered machine tools and a printing press. Due to the high cost of primary battery power, the motors were commercially unsuccessful and bankrupted Davenport. Several inventors followed Sturgeon in the development of DC motors, but all encountered the same battery cost issues. As no electricity distribution system was available at the time, no practical commercial market emerged for these motors. In 1855, Jedlik built a device using similar principles to those used in his electromagnetic self-rotors that was capable of useful work. He built a model electric vehicle that same year. A major turning point came in 1864, when Antonio Pacinotti first described the ring armature (although initially conceived in a DC generator, i.e. a dynamo). This featured symmetrically-grouped coils closed upon themselves and connected to the bars of a commutator, the brushes of which delivered practically non-fluctuating current. The first commercially successful DC motors followed the developments by Zénobe Gramme who, in 1871, reinvented Pacinotti's design and adopted some solutions by Werner Siemens. A benefit to DC machines came from the discovery of the reversibility of the electric machine, which was announced by Siemens in 1867 and observed by Pacinotti in 1869. Gramme accidentally demonstrated it on the occasion of the 1873 Vienna World’s Fair, when he connected two such DC devices up to 2 km from each other, using one of them as a generator and the other as motor. The drum rotor was introduced by Friedrich von Hefner-Alteneck of Siemens & Halske to replace Pacinotti’s ring armature in 1872, thus improving the machine efficiency. The laminated rotor was introduced by Siemens & Halske the following year, achieving reduced iron losses and increased induced voltages. In 1880, Jonas Wenström provided the rotor with slots for housing the winding, further increasing the efficiency. In 1886, Frank Julian Sprague invented the first practical DC motor, a non-sparking device that maintained relatively constant speed under variable loads. Other Sprague electric inventions about this time greatly improved grid electric distribution (prior work done while employed by Thomas Edison), allowed power from electric motors to be returned to the electric grid, provided for electric distribution to trolleys via overhead wires and the trolley pole, and provided control systems for electric operations. This allowed Sprague to use electric motors to invent the first electric trolley system in 1887–88 in Richmond, Virginia, the electric elevator and control system in 1892, and the electric subway with independently-powered centrally-controlled cars. The latter were first installed in 1892 in Chicago by the South Side Elevated Railroad, where it became popularly known as the "L". Sprague's motor and related inventions led to an explosion of interest and use in electric motors for industry. The development of electric motors of acceptable efficiency was delayed for several decades by failure to recognize the extreme importance of an air gap between the rotor and stator. Efficient designs have a comparatively small air gap. [a] The St. Louis motor, long used in classrooms to illustrate motor principles, is extremely inefficient for the same reason, as well as appearing nothing like a modern motor. Electric motors revolutionized industry. Industrial processes were no longer limited by power transmission using line shafts, belts, compressed air or hydraulic pressure. Instead, every machine could be equipped with its own power source, providing easy control at the point of use, and improving power transmission efficiency. Electric motors applied in agriculture eliminated human and animal muscle power from such tasks as handling grain or pumping water. Household uses of electric motors reduced heavy labor in the home and made higher standards of convenience, comfort and safety possible. Today, electric motors consume more than half of the electric energy produced in the US. In 1824 French physicist François Arago formulated the existence of rotating magnetic fields, termed Arago's rotations, which, by manually turning switches on and off, Walter Baily demonstrated in 1879 as in effect the first primitive induction motor.In the 1880s many inventors were trying to develop workable AC motors because AC's advantages in long-distance high-voltage transmission were offset by the inability to operate motors on AC. The first alternating-current commutatorless induction motor was invented by Galileo Ferraris in 1885. Ferraris was able to improve his first design by producing more advanced setups in 1886. In 1888, the Royal Academy of Science of Turin published Ferraris's research detailing the foundations of motor operation, while concluding at that time that "the apparatus based on that principle could not be of any commercial importance as motor." Possible industrial development was envisioned by Nikola Tesla, who invented independently his induction motor in 1887 and obtained a patent in May 1888. In the same year, Tesla presented his paper A New System for Alternating Current Motors and Transformers to the AIEE that described three patented two-phase four-stator-pole motor types: one with a four-pole rotor forming a non-self-starting reluctance motor, another with a wound rotor forming a self-starting induction motor, and the third a true synchronous motor with separately excited DC supply to rotor winding. One of the patents Tesla filed in 1887, however, also described a shorted-winding-rotor induction motor. George Westinghouse, who had already acquired rights from Ferraris (US$1,000), promptly bought Tesla's patents (US$60,000 plus US$2,5 per sold hp, paid until 1897), employed Tesla to develop his motors, and assigned C.F. Scott to help Tesla; however, Tesla left for other pursuits in 1889. The constant speed AC induction motor was found not to be suitable for street cars, but Westinghouse engineers successfully adapted it to power a mining operation in Telluride, Colorado in 1891. Westinghouse achieved its first practical induction motor in 1892 and developed a line of polyphase 60 hertz induction motors in 1893, but these early Westinghouse motors were two-phase motors with wound rotors. B.G. Lamme later developed a rotating bar winding rotor. Steadfast in his promotion of three-phase development, Mikhail Dolivo-Dobrovolsky invented the three-phase induction motor in 1889, of both types cage-rotor and wound rotor with a starting rheostat, and the three-limb transformer in 1890. After an agreement between AEG and Maschinenfabrik Oerlikon, Doliwo-Dobrowolski and Charles Eugene Lancelot Brown developed larger models, namely a 20-hp squirrel cage and a 100-hp wound rotor with a starting rheostat. These were the first three-phase asynchronous engines suitable for practical operation. Since 1889, similar developments of three-phase machinery were started Wenström. At the 1891 Frankfurt International Electrotechnical Exhibition, the first long distance three-phase system was successfully presented. It was rated 15 kV and extended over 175 km from the Lauffen waterfall on the Neckar river. The Lauffen power station included a 240 kW 86 V 40 Hz alternator and a step-up transformer while at the exhibition a step-down transformer fed a 100-hp three-phase induction motor that powered an artificial waterfall, representing the transfer of the original power source. The three-phase induction is now used for the vast majority of commercial applications. However, he claimed that Tesla's motor was not practical because of two-phase pulsations, which prompted him to persist in his three-phase work. The General Electric Company began developing three-phase induction motors in 1891. By 1896, General Electric and Westinghouse signed a cross-licensing agreement for the bar-winding-rotor design, later called the squirrel-cage rotor. Induction motor improvements flowing from these inventions and innovations were such that a 100-horsepower (HP) induction motor currently has the same mounting dimensions as a 7.5 HP motor in 1897. In an electric motor, the moving part is the rotor, which turns the shaft to deliver the mechanical power. The rotor usually has conductors laid into it that carry currents, which interact with the magnetic field of the stator to generate the forces that turn the shaft. Alternatively, some rotors carry permanent magnets, and the stator holds the conductors. The rotor is supported by bearings, which allow the rotor to turn on its axis. The bearings are in turn supported by the motor housing. The motor shaft extends through the bearings to the outside of the motor, where the load is applied. Because the forces of the load are exerted beyond the outermost bearing, the load is said to be overhung. The stator is the stationary part of the motor’s electromagnetic circuit and usually consists of either windings or permanent magnets. The stator core is made up of many thin metal sheets, called laminations. Laminations are used to reduce energy losses that would result if a solid core were used. The distance between the rotor and stator is called the air gap. The air gap has important effects, and is generally as small as possible, as a large gap has a strong negative effect on performance. It is the main source of the low power factor at which motors operate. The magnetizing current increases with the air gap. For this reason, the air gap should be minimal. Very small gaps may pose mechanical problems in addition to noise and losses. Windings are wires that are laid in coils, usually wrapped around a laminated soft iron magnetic core so as to form magnetic poles when energized with current. Electric machines come in two basic magnet field pole configurations: salient- and nonsalient-pole configurations. In the salient-pole machine the pole's magnetic field is produced by a winding wound around the pole below the pole face. In the nonsalient-pole, or distributed field, or round-rotor, machine, the winding is distributed in pole face slots. A shaded-pole motor has a winding around part of the pole that delays the phase of the magnetic field for that pole. Some motors have conductors that consist of thicker metal, such as bars or sheets of metal, usually copper, alternatively aluminum. These are usually powered by electromagnetic induction. A commutator is a mechanism used to switch the input of most DC machines and certain AC machines. It consists of slip-ring segments insulated from each other and from the shaft. 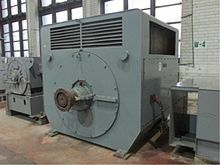 The motor's armature current is supplied through stationary brushes in contact with the revolving commutator, which causes required current reversal, and applies power to the machine in an optimal manner as the rotor rotates from pole to pole. In absence of such current reversal, the motor would brake to a stop. In light of improved technologies in the electronic-controller, sensorless-control, induction-motor, and permanent-magnet-motor fields, externally-commutated induction and permanent-magnet motors are displacing electromechanically-commutated motors. A DC motor is usually supplied through slip ring commutator as described above. AC motors' commutation can be either slip ring commutator or externally commutated type, can be fixed-speed or variable-speed control type, and can be synchronous or asynchronous type. Universal motors can run on either AC or DC. Fixed-speed controlled AC motors are provided with direct-on-line or soft-start starters. Variable-speed controlled AC motors are provided with a range of different power inverter, variable-frequency drive or electronic commutator technologies. The term electronic commutator is usually associated with self-commutated brushless DC motor and switched reluctance motor applications. Electric motors operate on three different physical principles: magnetism, electrostatics and piezoelectricity. By far, the most common is magnetism. In magnetic motors, magnetic fields are formed in both the rotor and the stator. The product between these two fields gives rise to a force, and thus a torque on the motor shaft. One, or both, of these fields must be made to change with the rotation of the motor. This is done by switching the poles on and off at the right time, or varying the strength of the pole. The main types are DC motors and AC motors, the former increasingly being displaced by the latter. AC electric motors are either asynchronous or synchronous. Once started, a synchronous motor requires synchronism with the moving magnetic field's synchronous speed for all normal torque conditions. In synchronous machines, the magnetic field must be provided by means other than induction such as from separately excited windings or permanent magnets. A fractional-horsepower (FHP) motor either has a rating below about 1 horsepower (0.746 kW), or is manufactured with a standard-frame size smaller than a standard 1 HP motor. Many household and industrial motors are in the fractional-horsepower class. Rotation is independent of the frequency of the AC voltage. Rotation is equal to synchronous speed (motor-stator-field speed). In SCIM, fixed-speed operation rotation is equal to synchronous speed, less slip speed. In non-slip energy-recovery systems, WRIM is usually used for motor-starting but can be used to vary load speed. Whereas induction- and synchronous-motor drives are typically with either six-step or sinusoidal-waveform output, BLDC-motor drives are usually with trapezoidal-current waveform; the behavior of both sinusoidal and trapezoidal PM machines is, however, identical in terms of their fundamental aspects. In variable-speed operation, WRIM is used in slip-energy recovery and double-fed induction-machine applications. A cage winding is a shorted-circuited squirrel-cage rotor, a wound winding is connected externally through slip rings. Mostly single-phase with some three-phase. LRA – Locked-Rotor Amps: The current you can expect under starting conditions when you apply full voltage. It occurs instantly during start-up. RLA – Rated-Load Amps: The maximum current a motor should draw under any operating conditions. Often mistakenly called running-load amps, which leads people to believe, incorrectly, that the motor should always pull these amps. FLA – Full-Load Amps: Changed in 1976 to "RLA – Rated-Load Amps". By definition, all self-commutated DC motors run on DC electric power. Most DC motors are small permanent magnet (PM) types. They contain a brushed internal mechanical commutation to reverse motor windings' current in synchronism with rotation. A commutated DC motor has a set of rotating windings wound on an armature mounted on a rotating shaft. The shaft also carries the commutator, a long-lasting rotary electrical switch that periodically reverses the flow of current in the rotor windings as the shaft rotates. Thus, every brushed DC motor has AC flowing through its rotating windings. Current flows through one or more pairs of brushes that bear on the commutator; the brushes connect an external source of electric power to the rotating armature. The rotating armature consists of one or more coils of wire wound around a laminated, magnetically "soft" ferromagnetic core. 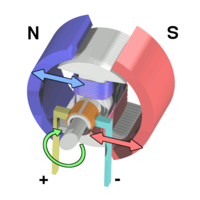 Current from the brushes flows through the commutator and one winding of the armature, making it a temporary magnet (an electromagnet). The magnetic field produced by the armature interacts with a stationary magnetic field produced by either PMs or another winding (a field coil), as part of the motor frame. The force between the two magnetic fields tends to rotate the motor shaft. The commutator switches power to the coils as the rotor turns, keeping the magnetic poles of the rotor from ever fully aligning with the magnetic poles of the stator field, so that the rotor never stops (like a compass needle does), but rather keeps rotating as long as power is applied. Many of the limitations of the classic commutator DC motor are due to the need for brushes to press against the commutator. This creates friction. Sparks are created by the brushes making and breaking circuits through the rotor coils as the brushes cross the insulating gaps between commutator sections. Depending on the commutator design, this may include the brushes shorting together adjacent sections—and hence coil ends—momentarily while crossing the gaps. Furthermore, the inductance of the rotor coils causes the voltage across each to rise when its circuit is opened, increasing the sparking of the brushes. This sparking limits the maximum speed of the machine, as too-rapid sparking will overheat, erode, or even melt the commutator. The current density per unit area of the brushes, in combination with their resistivity, limits the output of the motor. The making and breaking of electric contact also generates electrical noise; sparking generates RFI. Brushes eventually wear out and require replacement, and the commutator itself is subject to wear and maintenance (on larger motors) or replacement (on small motors). The commutator assembly on a large motor is a costly element, requiring precision assembly of many parts. On small motors, the commutator is usually permanently integrated into the rotor, so replacing it usually requires replacing the whole rotor. While most commutators are cylindrical, some are flat discs consisting of several segments (typically, at least three) mounted on an insulator. Large brushes are desired for a larger brush contact area to maximize motor output, but small brushes are desired for low mass to maximize the speed at which the motor can run without the brushes excessively bouncing and sparking. (Small brushes are also desirable for lower cost.) Stiffer brush springs can also be used to make brushes of a given mass work at a higher speed, but at the cost of greater friction losses (lower efficiency) and accelerated brush and commutator wear. Therefore, DC motor brush design entails a trade-off between output power, speed, and efficiency/wear. Armature circuit – A winding where the load current is carried, such that can be either stationary or rotating part of motor or generator. Field circuit – A set of windings that produces a magnetic field so that the electromagnetic induction can take place in electric machines. Commutation: A mechanical technique in which rectification can be achieved, or from which DC can be derived, in DC machines. A PM (permanent magnet) motor does not have a field winding on the stator frame, instead relying on PMs to provide the magnetic field against which the rotor field interacts to produce torque. Compensating windings in series with the armature may be used on large motors to improve commutation under load. Because this field is fixed, it cannot be adjusted for speed control. PM fields (stators) are convenient in miniature motors to eliminate the power consumption of the field winding. Most larger DC motors are of the "dynamo" type, which have stator windings. Historically, PMs could not be made to retain high flux if they were disassembled; field windings were more practical to obtain the needed amount of flux. However, large PMs are costly, as well as dangerous and difficult to assemble; this favors wound fields for large machines. To minimize overall weight and size, miniature PM motors may use high energy magnets made with neodymium or other strategic elements; most such are neodymium-iron-boron alloy. With their higher flux density, electric machines with high-energy PMs are at least competitive with all optimally designed singly-fed synchronous and induction electric machines. Miniature motors resemble the structure in the illustration, except that they have at least three rotor poles (to ensure starting, regardless of rotor position) and their outer housing is a steel tube that magnetically links the exteriors of the curved field magnets. Some of the problems of the brushed DC motor are eliminated in the BLDC design. In this motor, the mechanical "rotating switch" or commutator is replaced by an external electronic switch synchronised to the rotor's position. BLDC motors are typically 85–90% efficient or more. Efficiency for a BLDC motor of up to 96.5% have been reported, whereas DC motors with brushgear are typically 75–80% efficient. The BLDC motor's characteristic trapezoidal counter-electromotive force (CEMF) waveform is derived partly from the stator windings being evenly distributed, and partly from the placement of the rotor's permanent magnets. Also known as electronically commutated DC or inside out DC motors, the stator windings of trapezoidal BLDC motors can be with single-phase, two-phase or three-phase and use Hall effect sensors mounted on their windings for rotor position sensing and low cost closed-loop control of the electronic commutator. Compared to AC fans using shaded-pole motors, they are very efficient, running much cooler than the equivalent AC motors. This cool operation leads to much-improved life of the fan's bearings. Without a commutator to wear out, the life of a BLDC motor can be significantly longer compared to a DC motor using brushes and a commutator. 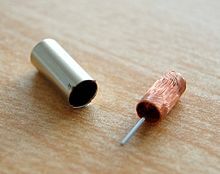 Commutation also tends to cause a great deal of electrical and RF noise; without a commutator or brushes, a BLDC motor may be used in electrically sensitive devices like audio equipment or computers. The same Hall effect sensors that provide the commutation can also provide a convenient tachometer signal for closed-loop control (servo-controlled) applications. In fans, the tachometer signal can be used to derive a "fan OK" signal as well as provide running speed feedback. The motor can be easily synchronized to an internal or external clock, leading to precise speed control. BLDC motors have no chance of sparking, unlike brushed motors, making them better suited to environments with volatile chemicals and fuels. Also, sparking generates ozone, which can accumulate in poorly ventilated buildings risking harm to occupants' health. BLDC motors are usually used in small equipment such as computers and are generally used in fans to get rid of unwanted heat. They are also acoustically very quiet motors, which is an advantage if being used in equipment that is affected by vibrations. Modern BLDC motors range in power from a fraction of a watt to many kilowatts. Larger BLDC motors up to about 100 kW rating are used in electric vehicles. They also find significant use in high-performance electric model aircraft. The SRM has no brushes or permanent magnets, and the rotor has no electric currents. Instead, torque comes from a slight misalignment of poles on the rotor with poles on the stator. The rotor aligns itself with the magnetic field of the stator, while the stator field windings are sequentially energized to rotate the stator field. The magnetic flux created by the field windings follows the path of least magnetic reluctance, meaning the flux will flow through poles of the rotor that are closest to the energized poles of the stator, thereby magnetizing those poles of the rotor and creating torque. As the rotor turns, different windings will be energized, keeping the rotor turning. SRMs are used in some appliances and vehicles. Modern low-cost universal motor, from a vacuum cleaner. Field windings are dark copper-colored, toward the back, on both sides. The rotor's laminated core is gray metallic, with dark slots for winding the coils. The commutator (partly hidden) has become dark from use; it is toward the front. The large brown molded-plastic piece in the foreground supports the brush guides and brushes (both sides), as well as the front motor bearing. A commutated electrically excited series or parallel wound motor is referred to as a universal motor because it can be designed to operate on AC or DC power. A universal motor can operate well on AC because the current in both the field and the armature coils (and hence the resultant magnetic fields) will alternate (reverse polarity) in synchronism, and hence the resulting mechanical force will occur in a constant direction of rotation. Operating at normal power line frequencies, universal motors are often found in a range less than 1000 watts. Universal motors also formed the basis of the traditional railway traction motor in electric railways. In this application, the use of AC to power a motor originally designed to run on DC would lead to efficiency losses due to eddy current heating of their magnetic components, particularly the motor field pole-pieces that, for DC, would have used solid (un-laminated) iron and they are now rarely used. An advantage of the universal motor is that AC supplies may be used on motors that have some characteristics more common in DC motors, specifically high starting torque and very compact design if high running speeds are used. The negative aspect is the maintenance and short life problems caused by the commutator. Such motors are used in devices, such as food mixers and power tools, that are used only intermittently, and often have high starting-torque demands. Multiple taps on the field coil provide (imprecise) stepped speed control. Household blenders that advertise many speeds frequently combine a field coil with several taps and a diode that can be inserted in series with the motor (causing the motor to run on half-wave rectified AC). Universal motors also lend themselves to electronic speed control and, as such, are an ideal choice for devices like domestic washing machines. The motor can be used to agitate the drum (both forwards and in reverse) by switching the field winding with respect to the armature. Whereas SCIMs cannot turn a shaft faster than allowed by the power line frequency, universal motors can run at much higher speeds. This makes them useful for appliances such as blenders, vacuum cleaners, and hair dryers where high speed and light weight are desirable. They are also commonly used in portable power tools, such as drills, sanders, circular and jig saws, where the motor's characteristics work well. Many vacuum cleaner and weed trimmer motors exceed 10,000 rpm, while many similar miniature grinders exceed 30,000 rpm. The design of AC induction and synchronous motors is optimized for operation on single-phase or polyphase sinusoidal or quasi-sinusoidal waveform power such as supplied for fixed-speed application from the AC power grid or for variable-speed application from VFD controllers. An AC motor has two parts: a stationary stator having coils supplied with AC to produce a rotating magnetic field, and a rotor attached to the output shaft that is given a torque by the rotating field. Large 4,500 HP AC Induction Motor. An induction motor is an asynchronous AC motor where power is transferred to the rotor by electromagnetic induction, much like transformer action. An induction motor resembles a rotating transformer, because the stator (stationary part) is essentially the primary side of the transformer and the rotor (rotating part) is the secondary side. Polyphase induction motors are widely used in industry. Induction motors may be further divided into Squirrel Cage Induction Motors and Wound Rotor Induction Motors (WRIMs). SCIMs have a heavy winding made up of solid bars, usually aluminum or copper, joined by rings at the ends of the rotor. When one considers only the bars and rings as a whole, they are much like an animal's rotating exercise cage, hence the name. Currents induced into this winding provide the rotor magnetic field. The shape of the rotor bars determines the speed-torque characteristics. At low speeds, the current induced in the squirrel cage is nearly at line frequency and tends to be in the outer parts of the rotor cage. As the motor accelerates, the slip frequency becomes lower, and more current is in the interior of the winding. By shaping the bars to change the resistance of the winding portions in the interior and outer parts of the cage, effectively a variable resistance is inserted in the rotor circuit. However, the majority of such motors have uniform bars. In a WRIM, the rotor winding is made of many turns of insulated wire and is connected to slip rings on the motor shaft. An external resistor or other control devices can be connected in the rotor circuit. Resistors allow control of the motor speed, although significant power is dissipated in the external resistance. A converter can be fed from the rotor circuit and return the slip-frequency power that would otherwise be wasted back into the power system through an inverter or separate motor-generator. The WRIM is used primarily to start a high inertia load or a load that requires a very high starting torque across the full speed range. By correctly selecting the resistors used in the secondary resistance or slip ring starter, the motor is able to produce maximum torque at a relatively low supply current from zero speed to full speed. This type of motor also offers controllable speed. Motor speed can be changed because the torque curve of the motor is effectively modified by the amount of resistance connected to the rotor circuit. Increasing the value of resistance will move the speed of maximum torque down. If the resistance connected to the rotor is increased beyond the point where the maximum torque occurs at zero speed, the torque will be further reduced. When used with a load that has a torque curve that increases with speed, the motor will operate at the speed where the torque developed by the motor is equal to the load torque. Reducing the load will cause the motor to speed up, and increasing the load will cause the motor to slow down until the load and motor torque are equal. Operated in this manner, the slip losses are dissipated in the secondary resistors and can be very significant. The speed regulation and net efficiency is also very poor. A torque motor is a specialized form of electric motor that can operate indefinitely while stalled, that is, with the rotor blocked from turning, without incurring damage. In this mode of operation, the motor will apply a steady torque to the load (hence the name). A common application of a torque motor would be the supply- and take-up reel motors in a tape drive. In this application, driven from a low voltage, the characteristics of these motors allow a relatively constant light tension to be applied to the tape whether or not the capstan is feeding tape past the tape heads. Driven from a higher voltage, (and so delivering a higher torque), the torque motors can also achieve fast-forward and rewind operation without requiring any additional mechanics such as gears or clutches. In the computer gaming world, torque motors are used in force feedback steering wheels. Another common application is the control of the throttle of an internal combustion engine in conjunction with an electronic governor. In this usage, the motor works against a return spring to move the throttle in accordance with the output of the governor. The latter monitors engine speed by counting electrical pulses from the ignition system or from a magnetic pickup and, depending on the speed, makes small adjustments to the amount of current applied to the motor. If the engine starts to slow down relative to the desired speed, the current will be increased, the motor will develop more torque, pulling against the return spring and opening the throttle. Should the engine run too fast, the governor will reduce the current being applied to the motor, causing the return spring to pull back and close the throttle. A synchronous electric motor is an AC motor distinguished by a rotor spinning with coils passing magnets at the same rate as the AC and resulting in a magnetic field that drives it. Another way of saying this is that it has zero slip under usual operating conditions. Contrast this with an induction motor, which must slip to produce torque. One type of synchronous motor is like an induction motor except the rotor is excited by a DC field. Slip rings and brushes are used to conduct current to the rotor. The rotor poles connect to each other and move at the same speed hence the name synchronous motor. Another type, for low load torque, has flats ground onto a conventional squirrel-cage rotor to create discrete poles. Yet another, such as made by Hammond for its pre-World War II clocks, and in the older Hammond organs, has no rotor windings and discrete poles. It is not self-starting. The clock requires manual starting by a small knob on the back, while the older Hammond organs had an auxiliary starting motor connected by a spring-loaded manually operated switch. Finally, hysteresis synchronous motors typically are (essentially) two-phase motors with a phase-shifting capacitor for one phase. They start like induction motors, but when slip rate decreases sufficiently, the rotor (a smooth cylinder) becomes temporarily magnetized. Its distributed poles make it act like a permanent magnet synchronous motor (PMSM). The rotor material, like that of a common nail, will stay magnetized, but can also be demagnetized with little difficulty. Once running, the rotor poles stay in place; they do not drift. Low-power synchronous timing motors (such as those for traditional electric clocks) may have multi-pole permanent magnet external cup rotors, and use shading coils to provide starting torque. Telechron clock motors have shaded poles for starting torque, and a two-spoke ring rotor that performs like a discrete two-pole rotor. Doubly fed electric motors have two independent multiphase winding sets, which contribute active (i.e., working) power to the energy conversion process, with at least one of the winding sets electronically controlled for variable speed operation. Two independent multiphase winding sets (i.e., dual armature) are the maximum provided in a single package without topology duplication. Doubly-fed electric motors are machines with an effective constant torque speed range that is twice synchronous speed for a given frequency of excitation. This is twice the constant torque speed range as singly-fed electric machines, which have only one active winding set. A doubly-fed motor allows for a smaller electronic converter but the cost of the rotor winding and slip rings may offset the saving in the power electronics components. Difficulties with controlling speed near synchronous speed limit applications. Nothing in the principle of any of the motors described above requires that the iron (steel) portions of the rotor actually rotate. If the soft magnetic material of the rotor is made in the form of a cylinder, then (except for the effect of hysteresis) torque is exerted only on the windings of the electromagnets. Taking advantage of this fact is the coreless or ironless DC motor, a specialized form of a permanent magnet DC motor. Optimized for rapid acceleration, these motors have a rotor that is constructed without any iron core. The rotor can take the form of a winding-filled cylinder, or a self-supporting structure comprising only the magnet wire and the bonding material. The rotor can fit inside the stator magnets; a magnetically soft stationary cylinder inside the rotor provides a return path for the stator magnetic flux. A second arrangement has the rotor winding basket surrounding the stator magnets. In that design, the rotor fits inside a magnetically soft cylinder that can serve as the housing for the motor, and likewise provides a return path for the flux. Because the rotor is much lighter in weight (mass) than a conventional rotor formed from copper windings on steel laminations, the rotor can accelerate much more rapidly, often achieving a mechanical time constant under one ms. This is especially true if the windings use aluminum rather than the heavier copper. But because there is no metal mass in the rotor to act as a heat sink, even small coreless motors must often be cooled by forced air. Overheating might be an issue for coreless DC motor designs. Modern software, such as Motor-CAD, can help to increase the thermal efficiency of motors while still in the design stage. Among these types are the disc-rotor types, described in more detail in the next section. The vibrating alert of cellular phones is sometimes generated by tiny cylindrical permanent-magnet field types, but there are also disc-shaped types that have a thin multipolar disc field magnet, and an intentionally unbalanced molded-plastic rotor structure with two bonded coreless coils. Metal brushes and a flat commutator switch power to the rotor coils. Related limited-travel actuators have no core and a bonded coil placed between the poles of high-flux thin permanent magnets. These are the fast head positioners for rigid-disk ("hard disk") drives. Although the contemporary design differs considerably from that of loudspeakers, it is still loosely (and incorrectly) referred to as a "voice coil" structure, because some earlier rigid-disk-drive heads moved in straight lines, and had a drive structure much like that of a loudspeaker. The printed armature or pancake motor has the windings shaped as a disc running between arrays of high-flux magnets. The magnets are arranged in a circle facing the rotor with space in between to form an axial air gap. This design is commonly known as the pancake motor because of its flat profile. The technology has had many brand names since its inception, such as ServoDisc. The printed armature (originally formed on a printed circuit board) in a printed armature motor is made from punched copper sheets that are laminated together using advanced composites to form a thin rigid disc. The printed armature has a unique construction in the brushed motor world in that it does not have a separate ring commutator. The brushes run directly on the armature surface making the whole design very compact. An alternative manufacturing method is to use wound copper wire laid flat with a central conventional commutator, in a flower and petal shape. The windings are typically stabilized with electrical epoxy potting systems. These are filled epoxies that have moderate, mixed viscosity and a long gel time. They are highlighted by low shrinkage and low exotherm, and are typically UL 1446 recognized as a potting compound insulated with 180 °C, Class H rating. The unique advantage of ironless DC motors is the absence of cogging (torque variations caused by changing attraction between the iron and the magnets). Parasitic eddy currents cannot form in the rotor as it is totally ironless, although iron rotors are laminated. This can greatly improve efficiency, but variable-speed controllers must use a higher switching rate (>40 kHz) or DC because of decreased electromagnetic induction. These motors were originally invented to drive the capstan(s) of magnetic tape drives, where minimal time to reach operating speed and minimal stopping distance were critical. Pancake motors are widely used in high-performance servo-controlled systems, robotic systems, industrial automation and medical devices. Due to the variety of constructions now available, the technology is used in applications from high temperature military to low cost pump and basic servos. Another approach (Magnax) is to use a single stator sandwiched between two rotors. One such design has produced peak power of 15 kW/kg, sustained power around 7.5 kW/kg. This yokeless axial flux motor offers a shorter flux path, keeping the magnets further from the axis. The design allows zero winding overhang; 100 percent of the windings are active. This is enhanced with the use of rectangular-section copper wire. The motors can be stacked to work in parallel. Instabilities are minimized by ensuring that the two rotor discs put equal and opposing forces onto the stator disc. The rotors are connected directly to one another via a shaft ring, cancelling out the magnetic forces. Magnax motors range in size from .15–5.4 metres (5.9 in–17 ft 8.6 in) in diameter. A servomotor is a motor, very often sold as a complete module, which is used within a position-control or speed-control feedback control system. Servomotors are used in applications such as machine tools, pen plotters, and other process systems. Motors intended for use in a servomechanism must have well-documented characteristics for speed, torque, and power. The speed vs. torque curve is quite important and is high ratio for a servo motor. Dynamic response characteristics such as winding inductance and rotor inertia are also important; these factors limit the overall performance of the servomechanism loop. Large, powerful, but slow-responding servo loops may use conventional AC or DC motors and drive systems with position or speed feedback on the motor. As dynamic response requirements increase, more specialized motor designs such as coreless motors are used. AC motors' superior power density and acceleration characteristics compared to that of DC motors tends to favor permanent magnet synchronous, BLDC, induction, and SRM drive applications. A servo system differs from some stepper motor applications in that the position feedback is continuous while the motor is running. A stepper system inherently operates open-loop—relying on the motor not to "miss steps" for short term accuracy—with any feedback such as a "home" switch or position encoder being external to the motor system. For instance, when a typical dot matrix computer printer starts up, its controller makes the print head stepper motor drive to its left-hand limit, where a position sensor defines home position and stops stepping. As long as power is on, a bidirectional counter in the printer's microprocessor keeps track of print-head position. A stepper motor with a soft iron rotor, with active windings shown. In 'A' the active windings tend to hold the rotor in position. In 'B' a different set of windings are carrying a current, which generates torque and rotation. Stepper motors are a type of motor frequently used when precise rotations are required. In a stepper motor an internal rotor containing permanent magnets or a magnetically soft rotor with salient poles is controlled by a set of external magnets that are switched electronically. A stepper motor may also be thought of as a cross between a DC electric motor and a rotary solenoid. As each coil is energized in turn, the rotor aligns itself with the magnetic field produced by the energized field winding. Unlike a synchronous motor, in its application, the stepper motor may not rotate continuously; instead, it "steps"—starts and then quickly stops again—from one position to the next as field windings are energized and de-energized in sequence. Depending on the sequence, the rotor may turn forwards or backwards, and it may change direction, stop, speed up or slow down arbitrarily at any time. Simple stepper motor drivers entirely energize or entirely de-energize the field windings, leading the rotor to "cog" to a limited number of positions; more sophisticated drivers can proportionally control the power to the field windings, allowing the rotors to position between the cog points and thereby rotate extremely smoothly. This mode of operation is often called microstepping. Computer controlled stepper motors are one of the most versatile forms of positioning systems, particularly when part of a digital servo-controlled system. Stepper motors were and still are often used in computer printers, optical scanners, and digital photocopiers to move the optical scanning element, the print head carriage (of dot matrix and inkjet printers), and the platen or feed rollers. Likewise, many computer plotters (which since the early 1990s have been replaced with large-format inkjet and laser printers) used rotary stepper motors for pen and platen movement; the typical alternatives here were either linear stepper motors or servomotors with closed-loop analog control systems. So-called quartz analog wristwatches contain the smallest commonplace stepping motors; they have one coil, draw very little power, and have a permanent magnet rotor. The same kind of motor drives battery-powered quartz clocks. Some of these watches, such as chronographs, contain more than one stepping motor. Closely related in design to three-phase AC synchronous motors, stepper motors and SRMs are classified as variable reluctance motor type. Stepper motors were and still are often used in computer printers, optical scanners, and computer numerical control (CNC) machines such as routers, plasma cutters and CNC lathes. A linear motor is essentially any electric motor that has been "unrolled" so that, instead of producing a torque (rotation), it produces a straight-line force along its length. Linear motors are most commonly induction motors or stepper motors. Linear motors are commonly found in many roller-coasters where the rapid motion of the motorless railcar is controlled by the rail. They are also used in maglev trains, where the train "flies" over the ground. On a smaller scale, the 1978 era HP 7225A pen plotter used two linear stepper motors to move the pen along the X and Y axes. Automotive accessories Rectifier, linear transistor(s) or DC chopper controller. UAVs Synchronous; single-phase or three-phase with PM rotor and trapezoidal stator winding; VFD typically VS PWM inverter type. Aircraft applications PWM and various other drive types, which tend to be used in very specialized / OEM applications. Only small ratings are economical Handheld power tools, blenders, vacuum cleaners, insulation blowers Variable single-phase AC, half-wave or full-wave phase-angle control with triac(s); closed-loop control optional. Variable-speed, traditionally, low-performance variable-torque pumps, fans, blowers and compressors. Variable-speed, increasingly, other high-performance constant-torque and constant-power or dynamic loads. Fixed-speed, low-performance applications of all types. Variable-speed, traditionally, WRIM drives or fixed-speed V/Hz-controlled VSDs. Variable-speed, increasingly, vector-controlled VSDs displacing DC, WRIM and single-phase AC induction motor drives. Stationary Power Tools Fixed or variable single-phase AC, variable speed being derived, typically, by full-wave phase-angle control with triac(s); closed-loop control optional. low power factor More costly Industrial motors Fixed or variable speed, three-phase; VFD typically six-step CS load-commutated inverter type or VS PWM inverter type. Aircraft applications VFD can be standard DTC type or VS inverter PWM type. Fans/Pumps, fast industrial and military servos Drives can typically be brushed or brushless DC type. Require a controller Positioning in printers and floppy disc drives; industrial machine tools Not a VFD. Stepper position is determined by pulse counting. The fundamental purpose of the vast majority of the world's electric motors is to electromagnetically induce relative movement in an air gap between a stator and rotor to produce useful torque or linear force. The most general approaches to calculating the forces in motors use tensors. s – motor slip; i.e., difference between synchronous speed and slip speed, which provides the relative movement needed for current induction in the rotor. Since the armature windings of a direct-current or universal motor are moving through a magnetic field, they have a voltage induced in them. This voltage tends to oppose the motor supply voltage and so is called "back electromotive force (emf)". The voltage is proportional to the running speed of the motor. The back emf of the motor, plus the voltage drop across the winding internal resistance and brushes, must equal the voltage at the brushes. This provides the fundamental mechanism of speed regulation in a DC motor. If the mechanical load increases, the motor slows down; a lower back emf results, and more current is drawn from the supply. This increased current provides the additional torque to balance the new load. In AC machines, it is sometimes useful to consider a back emf source within the machine; as an example, this is of particular concern for close speed regulation of induction motors on VFDs. Motor losses are mainly due to resistive losses in windings, core losses and mechanical losses in bearings, and aerodynamic losses, particularly where cooling fans are present, also occur. Losses also occur in commutation, mechanical commutators spark, and electronic commutators and also dissipate heat. is output angular velocity. It is possible to derive analytically the point of maximum efficiency. It is typically at less than 1/2 the stall torque. Various regulatory authorities in many countries have introduced and implemented legislation to encourage the manufacture and use of higher-efficiency electric motors. From this, he showed that the most efficient motors are likely to have relatively large magnetic poles. However, the equation only directly relates to non PM motors. All the electromagnetic motors, and that includes the types mentioned here derive the torque from the vector product of the interacting fields. For calculating the torque it is necessary to know the fields in the air gap. Once these have been established by mathematical analysis using FEA or other tools the torque may be calculated as the integral of all the vectors of force multiplied by the radius of each vector. The current flowing in the winding is producing the fields and for a motor using a magnetic material the field is not linearly proportional to the current. This makes the calculation difficult but a computer can do the many calculations needed. Once this is done a figure relating the current to the torque can be used as a useful parameter for motor selection. The maximum torque for a motor will depend on the maximum current although this will usually be only usable until thermal considerations take precedence. When optimally designed within a given core saturation constraint and for a given active current (i.e., torque current), voltage, pole-pair number, excitation frequency (i.e., synchronous speed), and air-gap flux density, all categories of electric motors or generators will exhibit virtually the same maximum continuous shaft torque (i.e., operating torque) within a given air-gap area with winding slots and back-iron depth, which determines the physical size of electromagnetic core. Some applications require bursts of torque beyond the maximum operating torque, such as short bursts of torque to accelerate an electric vehicle from standstill. Always limited by magnetic core saturation or safe operating temperature rise and voltage, the capacity for torque bursts beyond the maximum operating torque differs significantly between categories of electric motors or generators. Capacity for bursts of torque should not be confused with field weakening capability. Field weakening allows an electric machine to operate beyond the designed frequency of excitation. Field weakening is done when the maximum speed cannot be reached by increasing the applied voltage. This applies to only motors with current controlled fields and therefore cannot be achieved with permanent magnet motors. Electric machines without a transformer circuit topology, such as that of WRSMs or PMSMs, cannot realize bursts of torque higher than the maximum designed torque without saturating the magnetic core and rendering any increase in current as useless. Furthermore, the permanent magnet assembly of PMSMs can be irreparably damaged, if bursts of torque exceeding the maximum operating torque rating are attempted. Electric machines with a transformer circuit topology, such as induction machines, induction doubly-fed electric machines, and induction or synchronous wound-rotor doubly-fed (WRDF) machines, exhibit very high bursts of torque because the emf-induced active current on either side of the transformer oppose each other and thus contribute nothing to the transformer coupled magnetic core flux density, which would otherwise lead to core saturation. Electric machines that rely on induction or asynchronous principles short-circuit one port of the transformer circuit and as a result, the reactive impedance of the transformer circuit becomes dominant as slip increases, which limits the magnitude of active (i.e., real) current. Still, bursts of torque that are two to three times higher than the maximum design torque are realizable. The brushless wound-rotor synchronous doubly-fed (BWRSDF) machine is the only electric machine with a truly dual ported transformer circuit topology (i.e., both ports independently excited with no short-circuited port). The dual ported transformer circuit topology is known to be unstable and requires a multiphase slip-ring-brush assembly to propagate limited power to the rotor winding set. If a precision means were available to instantaneously control torque angle and slip for synchronous operation during motoring or generating while simultaneously providing brushless power to the rotor winding set, the active current of the BWRSDF machine would be independent of the reactive impedance of the transformer circuit and bursts of torque significantly higher than the maximum operating torque and far beyond the practical capability of any other type of electric machine would be realizable. Torque bursts greater than eight times operating torque have been calculated. The continuous torque density of conventional electric machines is determined by the size of the air-gap area and the back-iron depth, which are determined by the power rating of the armature winding set, the speed of the machine, and the achievable air-gap flux density before core saturation. Despite the high coercivity of neodymium or samarium-cobalt permanent magnets, continuous torque density is virtually the same amongst electric machines with optimally designed armature winding sets. Continuous torque density relates to method of cooling and permissible period of operation before destruction by overheating of windings or permanent magnet damage. where—specific torque density is normalized to 1.0 for the SPM—brushless ac, 180° current conduction, SPM is Surface Permanent Magnet machine. Torque density is approximately four times greater for electric motors which are liquid cooled, as compared to those which are air cooled. Another source notes that permanent-magnet synchronous machines of up to 1 MW have considerably higher torque density than induction machines. The continuous power density is determined by the product of the continuous torque density and the constant torque speed range of the electric machine. The latter source, which can be responsible for the "whining noise" of electric motors, is called electromagnetically-excited acoustic noise. An electrostatic motor is based on the attraction and repulsion of electric charge. Usually, electrostatic motors are the dual of conventional coil-based motors. They typically require a high-voltage power supply, although very small motors employ lower voltages. Conventional electric motors instead employ magnetic attraction and repulsion, and require high current at low voltages. In the 1750s, the first electrostatic motors were developed by Benjamin Franklin and Andrew Gordon. Today, the electrostatic motor finds frequent use in micro-electro-mechanical systems (MEMS) where their drive voltages are below 100 volts, and where moving, charged plates are far easier to fabricate than coils and iron cores. Also, the molecular machinery that runs living cells is often based on linear and rotary electrostatic motors. A piezoelectric motor or piezo motor is a type of electric motor based upon the change in shape of a piezoelectric material when an electric field is applied. Piezoelectric motors make use of the converse piezoelectric effect whereby the material produces acoustic or ultrasonic vibrations to produce linear or rotary motion. In one mechanism, the elongation in a single plane is used to make a series stretches and position holds, similar to the way a caterpillar moves. An electrically powered spacecraft propulsion system uses electric motor technology to propel spacecraft in outer space, most systems being based on electrically powering propellant to high speed, with some systems being based on electrodynamic tethers principles of propulsion to the magnetosphere. ^ Ganot provides a superb illustration of one such early electric motor designed by Froment. ^ The term 'electronic commutator motor' (ECM) is identified with the heating, ventilation and air-conditioning (HVAC) industry, the distinction between BLDC and BLAC being in this context seen as a function of degree of ECM drive complexity with BLDC drives typically being with simple single-phase scalar-controlled voltage-regulated trapezoidal current waveform output involving surface PM motor construction and BLAC drives tending towards more complex three-phase vector-controlled current-regulated sinusoidal waveform involving interior PM motor construction. 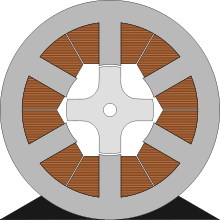 ^ The universal and repulsion motors are part of a class of motors known as AC commutator motors, which also includes the following now largely obsolete motor types: Single-phase – straight and compensated series motors, railway motor; three-phase – various repulsion motor types, brush-shifting series motor, brush-shifting polyphase shunt or Schrage motor, Fynn-Weichsel motor. ^ Faraday, Michael (1822). "On Some New Electro-Magnetical Motion, and on the Theory of Magnetism". Quarterly Journal of Science, Literature and the Arts. Royal Institution of Great Britain. XII: 74–96 (§IX). Retrieved 12 February 2013. ^ Guarnieri, M. (2014). "Electricity in the age of Enlightenment". IEEE Industrial Electronics Magazine. 8 (3): 60–63. doi:10.1109/MIE.2014.2335431. ^ Guarnieri, M. (2014). "The Big Jump from the Legs of a Frog". IEEE Industrial Electronics Magazine. 8 (4): 59–61+69. doi:10.1109/MIE.2014.2361237. ^ a b c d Guarnieri, M. (2018). "Revolving and Evolving – Early dc Machines". IEEE Industrial Electronics Magazine. 12 (3): 38–43. doi:10.1109/MIE.2018.2856546. ^ "The Development of the Electric Motor,". Early Electric Motors. SparkMuseum. Archived from the original on 6 March 2013. Retrieved 12 February 2013. ^ "The first dinamo?". travelhungary.com. Archived from the original on 20 July 2013. Retrieved 12 February 2013. ^ a b Guillemin, Amédée (1891). 'Le Magnétisme et l'Électricitée' [Electricity and Magnetism]. trans., ed. & rev. from the French by Sylvanus P. Thompson. McMillan and Co. Archived from the original on 2018-01-04. ^ Heller, Augustus (April 1896). "Anianus Jedlik". Nature. Norman Lockyer. 53 (1379): 516. Bibcode:1896Natur..53..516H. doi:10.1038/053516a0. ^ Blundel, Stephen J. (2012). Magnetism A Very Short Introduction. Oxford University Press. p. 36. ISBN 978-0-19-960120-2. ^ Thein, M. "Elektrische Maschinen in Kraftfahrzeugen" [Electric Machines in Motor Vehicles] (PDF) (in German). Archived from the original (PDF) on 14 September 2013. Retrieved 13 February 2013. ^ "Elektrische Chronologie". Elektrisiermaschinen im 18. und 19. Jahrhundert – Ein kleines Lexikon ("Electrical machinery in the 18th and 19th centuries – a small thesaurus") (in German). University of Regensburg. 2004. Archived from the original on June 9, 2011. Retrieved August 23, 2010. ^ "History of Batteries (inter alia)". Electropaedia. June 9, 2010. Archived from the original on May 12, 2011. Retrieved August 23, 2010. ^ a b "Battery and Energy Technologies, Technology and Applications Timeline". Archived from the original on 2 March 2013. Retrieved 13 February 2013. ^ Richter, Jan (7 February 2013). "Jacobi's Motor". Elektrotechnischen Instituts. Karlsruhe Institute of Technology. Archived from the original on 2017-05-12. Retrieved 14 May 2017. >. ^ Gee, William (2004). "Sturgeon, William (1783–1850)". Oxford Dictionary of National Biography. Oxford University Press. doi:10.1093/ref:odnb/26748. ^ Garrison, Ervan G. (1998). A History of Engineering and Technology: Artful Methods (2nd ed.). CRC Press. ISBN 978-0-8493-9810-0. Retrieved May 7, 2009. ^ Nye, David E. (1990). Electrifying America: Social Meanings of a New Technology. The MIT Press. ISBN 978-0-262-64030-5. Archived from the original on 2013-04-03. ^ "Exhibition on the History of Hungarian Science". Archived from the original on 26 August 2013. Retrieved 13 February 2013. ^ "Antonio Pacinotti". Archived from the original on 2016-03-05. ^ "The Power Makers: Steam, Electricity, and the Men Who Invented Modern America". Archived from the original on 2018-01-04. ^ "Zénobe Théophile Gramme". Invent Now, Inc. Hall of Fame profile. Archived from the original on 2012-11-01. Retrieved 2012-09-19. ^ a b Ganot, Adolphe (1881). Elementary Treatise in Physics. Trans. and ed. from the French by E. Atkinson (14th ed.). William Wood and Co. pp. 907–08, sec. 899. ^ "Photo of a traditional form of the St. Louis motor". Archived from the original on 2011-04-11. ^ "Buying an Energy-Efficient Electric Motor – Fact Sheet" (PDF). USDoE. Archived (PDF) from the original on 2011-09-02. ^ Babbage, C.; Herschel, J.F.W. (January 1825). "Account of the Repetition of M. Arago's Experiments on the Magnetism Manifested by Various Substances during the Act of Rotation". Philosophical Transactions of the Royal Society. 115: 467–96. doi:10.1098/rstl.1825.0023. Retrieved 2 December 2012. ^ Thompson, Silvanus Phillips (1895). Polyphase Electric Currents and Alternate-Current Motors (1st ed.). London: E. & F.N. Spon. p. 261. Retrieved 2 December 2012. ^ Baily, Walter (June 28, 1879). "A Mode of Producing Arago's Rotation". Philosophical Magazine. Taylor & Francis. 3 (1): 115–120. Bibcode:1879PPSL....3..115B. doi:10.1088/1478-7814/3/1/318. Archived from the original on December 1, 2016. ^ a b c Vučković, Vladan (November 2006). "Interpretation of a Discovery" (PDF). The Serbian Journal of Electrical Engineers. 3 (2). Archived (PDF) from the original on 4 July 2013. Retrieved 10 February 2013. ^ a b Jonnes, Jill (2004). Empires of Light: Edison, Tesla, Westinghouse, and the Race to Electrify the World. Random House. p. 180. Archived from the original on 2016-12-01. ^ a b c d Guarnieri, M. (2018). "The Development of ac Rotary Machines". IEEE Industrial Electronics Magazine. 12 (4): 28–32. doi:10.1109/MIE.2018.2874375. ^ Ferraris, G. (1888). "Atti della Reale Academia delle Science di Torino". Atti della R. Academia delle Science di Torino. XXIII: 360–75. ^ The Case Files: Nikola Tesla. "Two-Phase Induction Motor". The Franklin Institute. Archived from the original on 18 November 2012. Retrieved 2 December 2012. ^ "Galileo Ferraris Physicist, Pioneer of Alternating Current Systems (1847–1897) Inventor of the Induction Motor "Father of three-phase current" – Electrotechnical Congress, Frankfurt 1891". Edison Tech Center. Archived from the original on 1 August 2012. Retrieved 3 July 2012. ^ Smil, Vaclav (2005). Creating the Twentieth Century:Technical Innovations of 1867–1914 and Their Lasting Impact. Oxford University Press. p. 76. ISBN 978-0-19-988341-7. Archived from the original on 2016-12-01. ^ Froehlich, Fritz E.; Kent, Allen (1 December 1998). The Froehlich/Kent Encyclopedia of Telecommunications: Volume 17 – Television Technology. CRC Press. pp. 37–. ISBN 978-0-8247-2915-8. Archived from the original on 3 March 2013. Retrieved 10 October 2012. ^ a b Drury, Bill (2001). Control Techniques Drives and Controls Handbook. Institution of Electrical Engineers. p. xiv. ISBN 978-0-85296-793-5. Archived from the original on 2016-12-01. ^ Langsdorf, Alexander Suss (1955). Theory of Alternating-Current Machinery (2nd ed.). Tata McGraw-Hill. p. 245. ISBN 978-0-07-099423-2. ^ The Encyclopedia Americana. 19. 1977. p. 518. ^ a b "Galileo Ferraris". Encyclopædia Britannica. Archived from the original on 2012-04-22. ^ a b "Biography of Galileo Ferraris". Incredible People – Biographies of Famous People. Archived from the original on 2016-05-17. ^ a b Neidhöfer, Gerhard (2007). "Early Three-Phase Power (History)". IEEE Power and Energy Magazine. 5 (5): 88–100. doi:10.1109/MPE.2007.904752. ^ a b Pansini, Anthony J. (1989). Basic of Electric Motors. Pennwell Publishing Company. p. 45. ISBN 978-0-13-060070-7. ^ a b c d e Alger, P.L. ; Arnold z, R.E. (1976). "The History of Induction Motors in America". Proceedings of the IEEE. 64 (9): 1380–83. doi:10.1109/PROC.1976.10329. ^ Klooster, John W. (2009). Icons of Invention: The Makers of the Modern World from Gutenberg to Gates. ABC-CLIO, LLC. p. 305. ISBN 978-0-313-34746-7. Archived from the original on 12 November 2012. Retrieved 10 September 2012. ^ Day, Lance; McNeil, Ian, eds. (1996). Biographical Dictionary of the History of Technology. London: Routledge. p. 1204. ISBN 978-0-203-02829-2. Retrieved 2 December 2012. ^ Froehlich, Fritz E. Editor-in-Chief; Allen Kent Co-Editor (1992). The Froehlich/Kent Encyclopedia of Telecommunications: Volume 17 – Television Technology to Wire Antennas (First ed.). New York: Marcel Dekker, Inc. p. 36. ISBN 978-0-8247-2902-8. ^ The Electrical Engineer (21 September 1888). ... a new application of the AC in the production of rotary motion was made known almost simultaneously by two experimenters, Nikola Tesla and Galileo Ferraris, and the subject has attracted general attention from the fact that no commutator or connection of any kind with the armature was required ... Volume II. London: Charles & Co. p. 239. ^ Ferraris, Galileo (1885). "Electromagnetic Rotation with an Alternating Current". Electrican. 36: 360–75. ^ Tesla, Nikola; AIEE Trans. (1888). "A New System for Alternating Current Motors and Transformers". AIEE. 5: 308–24. Archived from the original on 15 November 2012. Retrieved 17 December 2012. ^ Harris, William (2008). "How Did Nikola Tesla Change the Way We Use Energy?". Howstuffworks.com. p. 3. Archived from the original on 31 August 2012. Retrieved 10 September 2012. ^ Mattox, D. M. (2003). The Foundations of Vacuum Coating Technology. Random House. p. 39. ISBN 978-0-8155-1495-4. Archived from the original on 2016-12-01. ^ Hughes, Thomas Parke (1983). Networks of Power: Electrification in Western society, 1880–1930. Johns Hopkins University Press. p. 117. ISBN 978-0-8018-2873-7. Archived from the original on 2016-12-01. ^ "Timeline of Nikola Tesla". Tesla Society of USA and Canada. Archived from the original on 8 May 2012. Retrieved 5 July 2012. ^ Hubbell, M.W. (2011). The Fundamentals of Nuclear Power Generation Questions & Answers. Authorhouse. p. 27. ISBN 978-1-4634-2441-1. ^ VDE Committee History of Electrical Engineering IEEE German Chapter (January 2012). "150th Birthday of Michael von Dolivo-Dobrowolsky Colloquium". 13. Archived from the original on 25 February 2013. Retrieved 10 February 2013. ^ Dolivo-Dobrowolsky, M. (1891). "Alternating current". ETZ. 12: 149, 161. ^ "How belt drives impact overhung load" (PDF). Gates Corporation. 2017. Archived from the original (PDF) on February 22, 2016. Retrieved July 28, 2017. ^ Hameyer 2001, p. 62. ^ Lee, Norman C. (2006). Practical Guide to Blow Moulding. iSmithers Rapra Publishing. p. 82. ISBN 978-1-85957-513-0. ^ Kim, Sang-Hoon (2017). Electric Motor Control: DC, AC, and BLDC Motors. Elsevier. ISBN 97-80128123195. ^ "Variable Speed Pumping, A Guide to Successful Applications, Executive Summary" (PDF). USDOE – Europump – Hydraulic Institute. May 2004. p. 9, Fig. ES–7. Archived from the original (PDF) on October 27, 2011. Retrieved February 19, 2018. ^ Bose 2006, pp. 328, 397, 481. ^ Knight, Andy. Electric Machines. U. of Alberta. Archived from the original on 18 July 2013. Retrieved 20 February 2013. ^ a b Hameyer 2001. ^ a b c d Ionel, D.M. (2010). "High-Efficiency Variable-Speed Electric Motor Drive Technologies for Energy Savings in the US Residential Sector". 12th International Conference on Optimization of Electrical and Electronic Equipment (OPTIM). IEEE. pp. 1403–14. doi:10.1109/OPTIM.2010.5510481. ^ Krishnan, R. (2008). Permanent Magnet Synchronous and Brushless DC Motor Drives. CRC. p. xvii. ISBN 978-0-8247-5384-9. Archived from the original on 2018-01-04. ^ Liu, Chen-Ching; et al. (1997). "§66.1 'Generators' in Chapter 66 – 'Electric Machines' of Section 6 – 'Energy'". In Dorf, Richard C. (editor-in-chief) (ed.). The Electrical Engineering Handbook (3rd ed.). CRC Press. p. 1456. ISBN 0-8493-8574-1. Archived from the original on 2018-01-04. ^ Nozawa, Tetsuo (2009). "Tokai University Unveils 100W DC Motor with 96% Efficiency". Tech-On – Nikkei Electronics. Archived from the original on 2011-01-01. ^ Bush, Steve (2009). "Dyson vacuums 104,000 rpm brushless DC technology". Electronics Weekly Magazine. Archived from the original on 2012-04-11. ^ "Tesla Model 3 Motor – Everything I've Been Able To Learn About It (Welcome To The Machine) | CleanTechnica". cleantechnica.com. March 11, 2018. Retrieved 2018-06-18. ^ Lander, Cyril W. (1993). "§9–8 'Slip Ring Induction Motor Control' in Chapter 9 – A.C. Machine Control". Power electronics (3rd ed.). McGraw-Hill 480 pages. ISBN 0-07-707714-8. ^ a b c d e Krishnan, R. (March 1987). "Selection Criteria for Servo Motor Drives". IEEE Transactions on Industry Applications. IA-23 (2): 270–75. doi:10.1109/TIA.1987.4504902. ^ a b Blain, Loz (May 30, 2018). "Magnax prepares to manufacture radically high-powered, compact axial flux electric motor". newatlas.com. Retrieved 2018-06-18. ^ Patrick, Dale R.; Fardo, Stephen W. (1997). "Chapter 11". Rotating Electrical Machines and Power Systems (2nd ed.). Fairmont Press, Inc. ISBN 978-0-88173-239-9. ^ a b Bose 2006, pp. 569–70, 891. ^ Fenoglio, John A.; Chin, Bessie W.C.; Cobb, Terry R. (February 1979). "A High-Quality Digital X-Y Plotter Designed for Reliability, Flexibility and Low Cost" (PDF). Hewlett-Packard Journal. Archived (PDF) from the original on 27 March 2012. Retrieved 9 February 2012. ^ a b c d Stölting, Kallenbach & Amrhein 2008, p. 9. ^ Stölting, Kallenbach & Amrhein 2008, p. 5. ^ a b Bose 2006, pp. 480–81. ^ Bose 2006, pp. 569–70. ^ Vukosavic, Slobodan; Stefanovic, Victor R. (November–December 1991). "SRM Inverter Topologies: A Comparative Evaluation". IEEE Trans. On Industry Applications. 27 (6): 1034–47. doi:10.1109/IAS.1990.152299. ^ Roters, Herbert C. (January 1947). "The hysteresis motor –Advances which permit economical fractional horsepower ratings". Trans. AIEE. 66 (1): 1419–30. doi:10.1109/T-AIEE.1947.5059594. ^ Bakshi, U.A. ; Bakshi, M.V. (2009). "§9.3 'Hysteresis Motors' in Chapter 9 – Special Machines". Electrical Machines – II (4th ed.). Technical Publications Pune. ISBN 81-8431-189-3. Archived from the original on 2018-01-04. ^ Lendenmann, Heinz; et al. "Motoring Ahead" (PDF). Retrieved April 18, 2012. ^ Stölting, Kallenbach & Amrhein 2008, p. 10. ^ Bose 2006, p. 389. ^ Kirtley, James L., Jr. (2005). "Class Notes 1: Electromagnetic Forces" (PDF). 6.6585 – Electric Machines. MIT Dept of Electrical Engineering. Archived (PDF) from the original on 4 January 2017. Retrieved 15 March 2013. ^ "DC Motor Calculations, part 1". National Instruments. 30 November 2011. Archived from the original on 12 October 2007. Retrieved 7 December 2012. ^ Laithwaite, E.R. (February 1975). "Linear electric machines – A personal view". Proceedings of the IEEE. 63 (2): 250–90. doi:10.1109/PROC.1975.9734. ^ Patterson, D.J. ; Brice, C.W. ; Dougal, R.A.; Kovuri, D. (1–4 June 2003). "The "Goodness" of Small Contemporary Permanent Magnet Electric Machines" (PDF). Electric Machines and Drives Conference, 2003. IEMDC'03. vol. 2. IEEE. pp. 1195–200. doi:10.1109/IEMDC.2003.1210392. Archived (PDF) from the original on 13 June 2010. ^ Klatt, Frederick W. (September 2012). Sensorless Real Time Control (RTC): Brushless Wound-Rotor [Synchronous] Doubly-Fed Machine. Sensorless Control for Electrical Drives – SLED 2012. IEEE. pp. 1–6. doi:10.1109/SLED.2012.6422811. ISBN 978-1-4673-2967-5. ^ Miller, John M. (2008). Propulsion Systems for Hybrid Vehicles. IET. pp. 68, 69. ISBN 978-0-86341-915-7. ^ Rashid, Muhammad H. (2017). Power Electronics Handbook. Butterworth-Heinemann. p. 1042. ISBN 978-0-12-811408-7. ^ Steimel, Andreas (2008). Electric Traction – Motive Power and Energy Supply: Basics and Practical Experience. Oldenbourg Industrieverlag. p. 142. ISBN 978-3-8356-3132-8. ^ Horn, Alexander (2009). Ultra-fast Material Metrology. John Wiley & Sons. ISBN 978-3-527-62793-6. ^ Shafik, Amro; Ben Mrad, Ridha (2016). Nanopositioning Technologies: Fundamentals and Applications. Springer International Publishing. p. 39. doi:10.1007/978-3-319-23853-1_2. ISBN 978-3-319-23853-1. ^ "Launch Assist Tethers". www.tethers.com. Archived from the original on 2017-11-16. Retrieved 2017-09-15. Fink, Donald G.; Beaty, H. Wayne (2000). Standard Handbook for Electrical Engineers. McGraw-Hill. ISBN 978-0-07-022005-8. Kuphaldt, Tony R. (2000–2006). "Chapter 13 AC Motors". Lessons In Electric Circuits – Volume II. Retrieved 2006-04-11. Rosenblatt, Jack; Friedman, M. Harold (1984). Direct and Alternating Current Machinery. C.E. Merrill Publishing Company. ISBN 978-0-675-20160-5. Knowlton, A.E., ed. (1949). Standard Handbook for Electrical Engineers (8th ed.). McGraw-Hill. Stölting, Hans-Dieter D.; Kallenbach Eberhard; Amrhein, W., eds. (2008). Handbook of Fractional-Horsepower Drives. Springer. ISBN 978-3-540-73128-3. Hameyer, Kay (2001). "Electrical Machine I: Basics, Design, Function, Operation" (PDF). RWTH Aachen University Institute of Electrical Machines. Archived from the original (PDF) on 10 February 2013. Retrieved 11 January 2013. Bedford, B.D. ; Hoft, R.G. (1964). Principles of Inverter Circuits. New York: Wiley. ISBN 978-0-471-06134-2. Bose, Bimal K. (2006). Power Electronics and Motor Drives : Advances and Trends. Academic Press. ISBN 978-0-12-088405-6. Chiasson, John (2005). Modeling and High-Performance Control of Electric Machines (Online ed.). Wiley. ISBN 978-0-471-68449-7. Fitzgerald, A.E. ; Kingsley, Charles, Jr.; Umans, Stephen D. (2003). Electric Machinery (6th ed.). McGraw-Hill. pp. 688 pages. ISBN 978-0-07-366009-7. Pelly, B.R. (1971). Thyristor Phase-Controlled Converters and Cycloconverters : Operation, Control, and Performance. Wiley-Interscience. ISBN 978-0-471-67790-1. Wikimedia Commons has media related to Electric motors. IEA 4E – Efficient Electrical End-Use Equipment.